Cooley LLP announced today that 2013 was a record year for capital markets work. Cooley advised on a total of 60 public offerings in 2013, including 23 initial public offerings, raising more than $8.4 billion. According to IPO Vital Signs, Cooley was the number one law firm advising on technology and life sciences IPOs in the United States last year. Cooley also ranked first as company counsel advising on technology and life sciences IPOs, first as company counsel for life sciences IPOs, second as company counsel for technology IPOs and second as company counsel for all IPOs across industries. Cooley was also the number one law firm overall advising on venture capital-backed IPOs in the United States, number one for venture-backed technology and life sciences IPOs and number one as company counsel for venture-backed technology and life sciences IPOs, according to IPO Vital Signs and Pitchbook. "It was a tremendous year for innovative companies going to the capital markets," said Fred Muto, chair of Cooley's business department. "On both coasts, Cooley remains one of the true go-to firms for both issuers and investment banks. We are all excited for 2014 and have a deep pipeline of deals heading into the new year." Cooley's capital markets lawyers advise issuers, investment banks and investors in equity and debt transactions that raise capital through the public and private capital markets. In 2013, Cooley counseled a broad range of clients including ChannelAdvisor Corp., Criteo S.A., FireEye Inc., Isis Pharmaceuticals Inc., Jazz Pharmaceuticals plc, LinkedIn Corp., NVIDIA Corp., Stratasys Ltd., Tableau Software Inc., Yelp Inc. and zulily Inc., as well as all the leading investment banks. 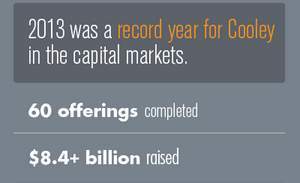 For a dynamic summary of Cooley's 2013 capital markets successes, please view the firm's capital markets 2013 IPO Infographic. 2013 was a record year for Cooley in the capital markets.